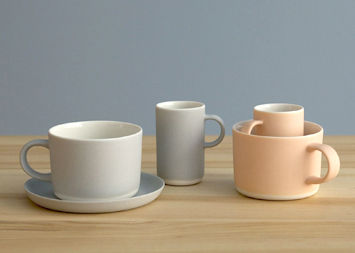 + Studio Production — studio Nathalie L.
The thin ceramic tableware of Studio Nathalie L. is handmade by slip-casting in small scale production. The manufacturing is carefully mastered from designing the stained clay bodies and glazes till the finishing of the objects. 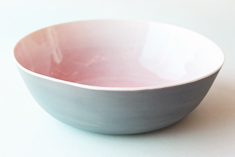 Nathalie Lautenbacher put up her studio year 1999 – design year of the first bowl of the series. Since then, new items emerge year by year. Glasses: Jaakko Liikanen, Wooden box: Kuutti Kaitila. 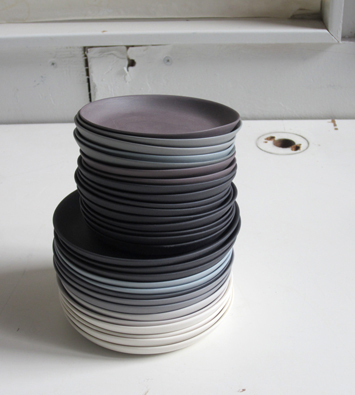 NNNL items are designed and produced by Naoto Niidome and Nathalie Lautenbacher. Available in small series by request. Needle Cushion. (above) Material: Porcelain, Textile. Trivet for a Ceramic Tea pot. (right) Material: Porcelain, Metal and Textile.